It contains – isabolol, which has soothing properties, and 5% mattifying agent which will absorb excess sebum and help to tone down the shiny appearance of greasy skin. Suitable for oily skin with imperfections. 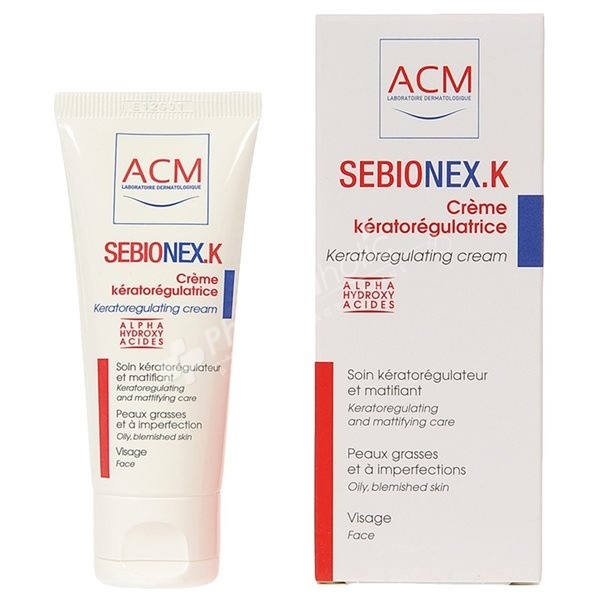 Sebionex K cream possesses a triple action. It contains an AHA complex (acids, esters and salts of AHA) and thus exerts keratolytic action on the superficial layers of the epidermis. It contains – isabolol, which has soothing properties, and 5% mattifying agent which will absorb excess sebum and help to tone down the shiny appearance of greasy skin. Suitable for oily skin with imperfections. Apply to clean & dry skin. Aqua (Water), Ammonium Glycolate, Nylon-12, C12-13 Alkyl Lactate, Steareth-21, Butylene glycol, Glycolic Acid, Ammonium Lactate, Steareth-2, Cyclopentasiloxane, Peg-150/Decyl Alcohol/SMDI Copolymer, Bisabolol, Lactic Acid, Zinc Gluconate, Polyacrylamide,C13-14 Isoparaffin, Propylene Glycol, Laureth-7, Diazolidinyl Urea, Methylparaben, Propylparaben, Xanthan Gum, Parfum (Fragrance).